Dupont Maskomal is a powerful, high quality and effective disinfectant and deodoriser that has been specially designed to be used in agriculture and industry to be able to mask any smell that may be causing problems, and is sure to make the environment of any animal housing smell excellent no matter what kind of odour has been present. 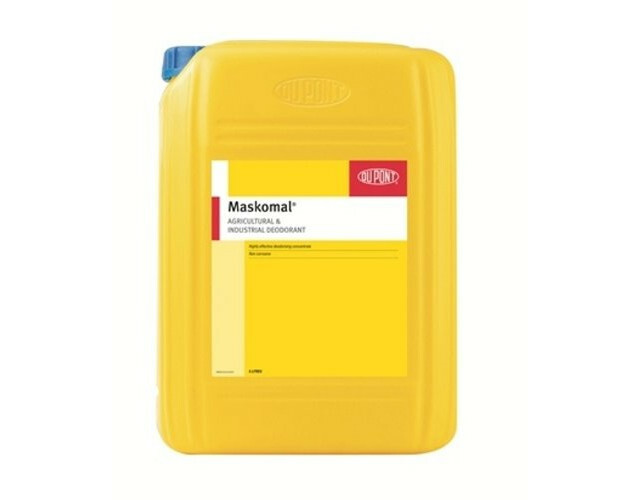 Dupont Maskomal has been specially formulated and is ideal for use in eliminating dirt and accumulated bacteria in manure tips, slurry tanks, as well as of course animal housing, and horse stables. This product can also be used regularly without posing any threat to humans or livestock comes in a handy 5 litre supply which is sure to provide the stable of the horse, as well as any agricultural or industrial area with a lovely scent. 1:100 - 1:1000 (100ml - 10ml per 10 litres of water) depending of the severity of the odour. Spray into the atmosphere between the source of the odour and the potential source of offence. Apply directly to slurry or other liquid wastes at a rate of 100ml of Maskomal to 2,500 litres of liquid. There are currently no questions for DuPont Maskomal Disinfectant & Deodorisor - be the first to ask one!